IMAGE: Students at Marjory Stoneman Douglas H.S. in Parkland, Florida, where Nik Cruz was trained to shoot, practice in the School’s Cafeteria/Firing Range. The U.S. Army taught Florida killer Nikolas Cruz how to shoot a lethal weapon in his high school cafeteria when he was 14. Nik was a member of the school’s JROTC program. Nearly 2,000 U.S. high schools have military shooting programs. Our plan is to shut them down. During lunch, military recruiters forge relationships with kids. After lunch, the same cafeterias are transformed into firing ranges. The marksmanship programs typically use CO2-powered long rifles that shoot .177 caliber lead pellets at speeds up to 600 feet per second. They are lethal weapons. 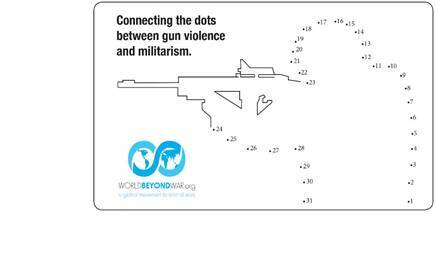 Militarism is a contributing cause of gun violence in America. These shooting programs don’t belong in our schools! The connection between military programs in the schools and gun violence is, amazingly, not being addressed by the March for Our Lives organizers. We'll have to do it! This campaign allows you to send a simple message to your state legislators demanding the closure of high school marksmanship programs. Just click "START WRITING." P.S. To find high school shooting programs in your state, click here and select your state.